I'm trying to create a wireless bridge at home to connect my xbox360 to the wireless network without buying the official xbox adaptor. 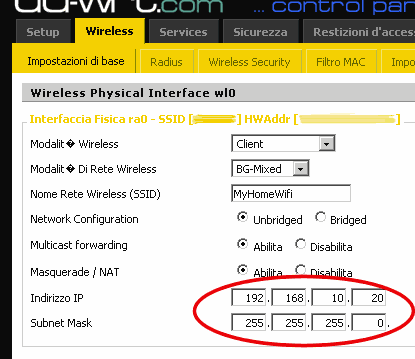 I've bought a d-link dir-600 which i've flashed with the v24 sp2 dd-wrt firmware successfully and im following the instructions here http://www.dd-wrt.com/wiki/index.php/Wireless_Bridge to create a bridge. The problem is with step 7. Wireless > Basic Settings: choose "Client-Bridged" as Wireless Mode, on my router, i only get the AP, client, ad-hoc, repeater and repeater bridge options. Is client the same as client bridged? My primary router is a Linksys WAG54G. Any help would be appreciated. 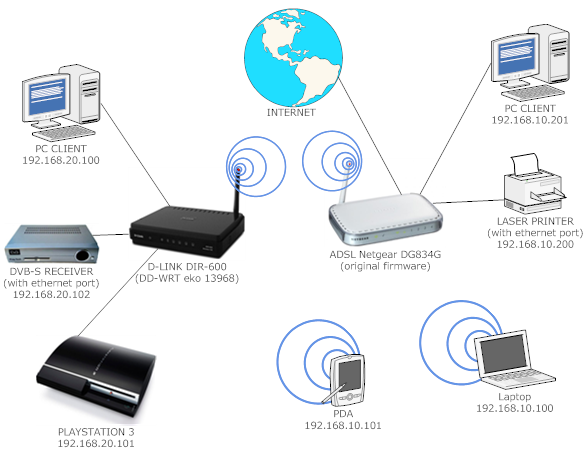 I use DIR-600 as AP (flashed with DDWRT) and a belkin router as client bridge, similar purpose as u -- connect my xbox 360 and HTPC online without routing a cable. I just checked the FW on my DIR600, you are correct, DIR 600 doestnt have a "client bridge" option. But according to official wiki, repeater bridge should be an extended function to client bridge. Repeater-Bridge mode is just like Client-Bridge mode, but R-B mode has added range and capability to add wireless clients if you want. If you get it working, post in this thread here about how you did it. Hi, i've one D-Link DIR-600 with DD-WRT firmware (version eko 24 sp2 13968). I'he found a mode to realize a feke-client bridge mode with this router and anyone other access point. 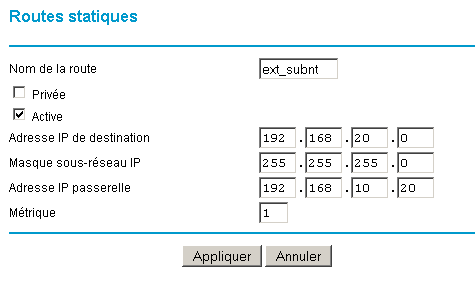 The result is that i've 2 different subnets thet dialogue in bidirectional sense and use the same gateway for external requests. 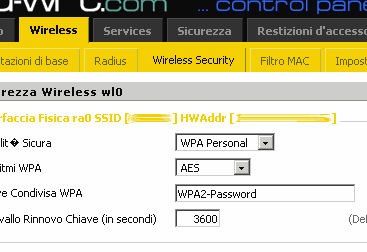 2) Set Wireless mode to Client (simple) and set same security parameters (WEP / WPA / WPA2 / ... such as on Access Point). 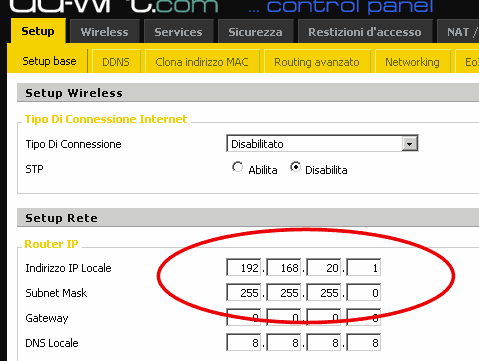 IMPORTANT: The Client mode must be setted to unbridged, with IP of same Class of Access Point. 3) Now you need to work on Routing Tables. 4) Save all and reboot. 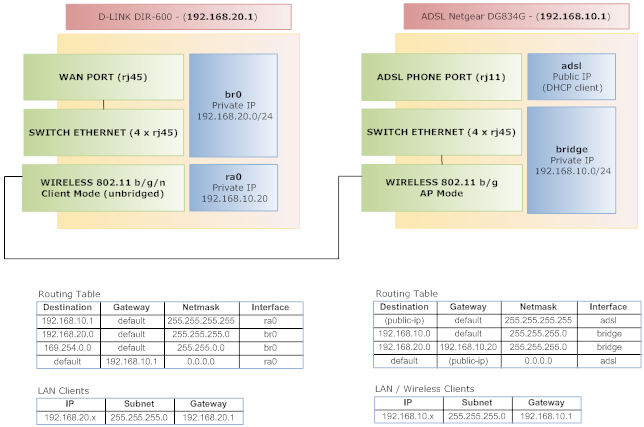 The two subnet (192.168.10.0 and 192.168.20.0) are now connected with routing rules and every clients of one subnet can dialogue with every clients of other subnet (and vice-versa). I've been trying to follow the directions here but can't seem to get it working. I am also wanting to do the same thing, i.e. have a client/repeater bridge, but the DIR-600 does not have a client bridge mode, and I can't get the repeater bridge working. So, trying this method as an alternative. Can you please add in more details to the instructions, and also show what the settings are for the other parameters. I am using the latest recommended version of DD-WRT for DIR-600. I am also having problems setting it up just as a basic client even. Any help would be very much appreciated. Thanks. I have try 1 guide but didn't work. Make sure the virtual interfaces in wireless, wireless basic tab is not enable. When u enable the security, u need to activate the physical interface password only. The 2 time power up cycle could be working.